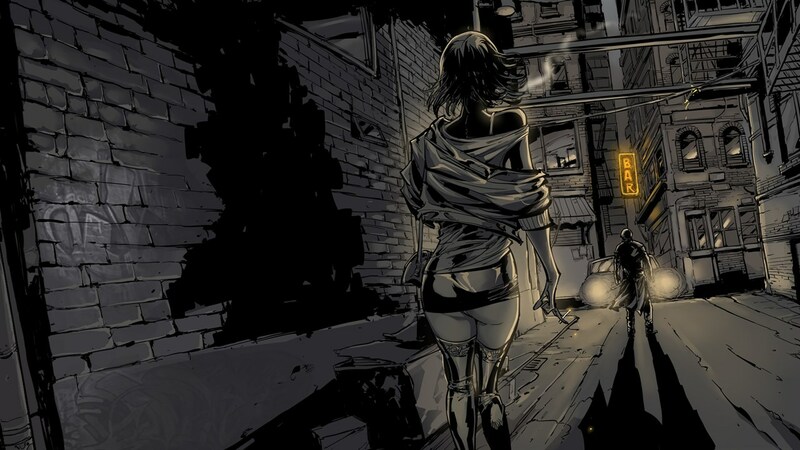 Metropolis: Lux Obscura is a match-three puzzle game hidden inside a digital motion comic. You play as John Lockhart, a dodgy dealer who has just come out of prison for a murder he didn’t commit. Skint and down in the dumps, Lockhart sees no better way to earn some quick cash than to carry out some errands for the local crime boss. This leads to plenty of violence, drugs and profanity mixed with its fair share of candie crushing. No, that wasn’t a typo. Heavily influenced by the likes of Sin City and the Noir genre in general, Metropolis: Lux Obscura pulls no punches in turning the usual family-friendly match-three puzzler into an adult only graphic tale. It manages to tick all the boxes of the seedy Noir stereotypes yet completely forgets to add in an interesting plot. You have the grimy city where it’s always raining. All the women are either gorgeous strippers or uncontrollably promiscuous, and the ageing lead character is a shadow of his former self yet somehow scores with every woman that crosses his path. As for the plot itself? Well, it’s more of a collection of snippets that falls in line with the source material that it is desperately trying to replicate. That’s because Metropolis: Lux Obscura is trying to shoehorn a puzzle game into the story as often as it can. This, in effect, completely breaks any flow of plot the story could potentially have to offer. The match-three puzzle element is set up as a battleground. Every time someone tries to deck you, or an Elvis impersonator with a switchblade in his guitar wants to mug you (don’t ask) you are sent into a battle state as a way to settle your differences. During a bout, there are various attack icons scattered around a grid, each with different attack strength that’s used to chip away at your opponent’s HP meter. The more of the same icon you match, the more powerful the attack will be. In between attack icons, you have recovery icons to top up your health as well as a rage icon that will give you an extra boost to your stats for the duration of the fight. However, what you don’t want to be doing is matching a set of police badges. Accidentally matching a set of these will topple your HP faster than you can light a crooked cigarette. As for your opponents? They will usually attack in a select number of turns. Once the opponent’s HP hits zero, you win the fight. After each successful fight, you are rewarded with a little upgrade to help you on your way. It’s all very generic in practice and has been done a million times before. Well, not so much in this particular style, but there’s nothing really fresh here gameplay-wise that you can’t get on a mobile app store for free. The success of winning a fight is also a bit too dependent on the hand you’re dealt, making it more of a thing to do until you’re successful as opposed to being a puzzle to solve. The idea is interesting enough in premise, it just doesn’t gel well together enough to make any of it feel particularly immersive. The whole thing is just a string of reasons to get into a brawl while being as X-rated as it can get away with being. Now, I don’t mind games with adult content, in fact, it was one of the elements that hooked my interest. I think it’s more the lost potential that Metropolis: Lux Obscura let’s slip through its fingers that I had the biggest issue with. The thing is, I actually found the presentation itself quite decent. The art style is very well crafted by Ukrainian artist Oleg Okunev, whose talents set up the theme that the game is going for exceptionally well. The voice acting isn’t too bad either, doing its best to enhance the whole Noir mood that the effective art style provides. It’s more the space in between that falls flat on its face. It’s like sinking into an attractive cake only to find a dry, bland filling contained within. Thankfully, Metropolis: Lux Obscura is very short depending on how long the fights will take you to beat. There are four endings that are promised but I only had the motivation to see it through once. The rest I’ll probably just stream on YouTube at some point. At £7.19, Metropolis: Lux Obscura is affordable enough to land a quick fix should you desperately need one, although in comparison to the average mobile match-three puzzler it stands highly overpriced.